Above: Molly Smitten-Downes is this year's UK entry. Every year, European nations come together to compete in the Eurovision Song Contest, battling against their neighbours for the most viewer votes. Eurovision has a lot to answer for fashion-wise. Known for its naff costume choices, the competition can make very interesting viewing. 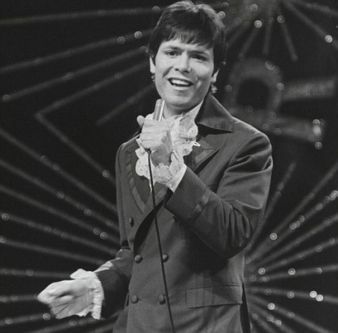 Cliff Richard sported this smart suit with a fabulously frilly shirt. Lulu looks pretty in a pink floral dress..
Head-to-Toe Leather: In 2011, Bonnie Tyler went for an all-leather look..
And it's not just the United Kingdom turning up in an array of questionable and outrageous costumes. A not-so-subtle hint for her boyfriend, Finland's Krista Siegfrids rocked a wedding dress for her performance. Zdob si Zdub from Moldova sported pointed hats, and even had a unicycle on stage. Will you be watching Eurovision this year? Do you have a favourite Eurovision outfit?